What a cute way to display your towels! 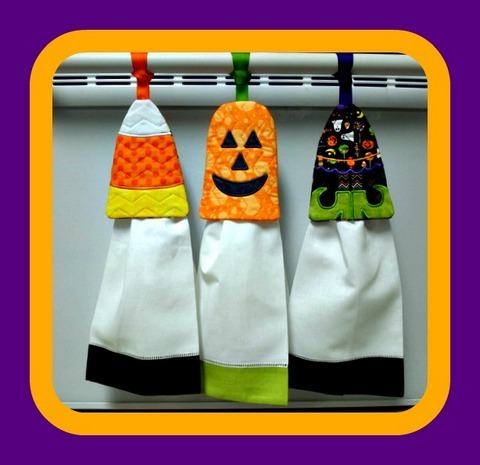 These Halloween Cuties Towel Keepers are designed with a ring on the back to loop your towel into and add a little decor to your kitchen. Made completely in the 5" x 7" embroidery hoop, they are quick and easy to make and fun to make and give. Full color step by step photo instructions included in a pdf to show how to make your own. NOTE: A 3" metal or plastic ring will be needed to complete. Display towels are from All About Blanks. Click below to see the other coordinating sets.